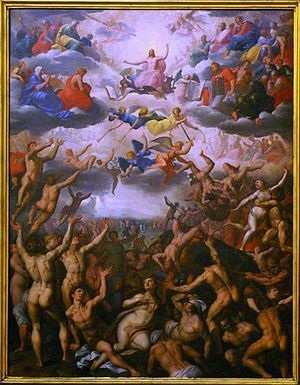 The Last Judgment: believers ascend into Heaven while sinners and those who reject the faith are doomed to Hell. Religious exclusivism is the doctrine that the adherents of a particular faith, or group of faiths, will attain salvation while groups that do not share this faith will not attain the blessings associated with such a state. In its more extreme form, religious exclusivism teaches that only the members of one religion or sect will reach Heaven, while others will be doomed to eternal damnation. The opposite of religious exclusivism is universalism, the teaching that all will eventually share in the eternal blessings of God or the heavenly realm. Exclusivism is most prevalent in Abrahamic religions. In Jewish tradition, it manifests in certain interpretations of the concepts of the Chosen people, in which anyone who does not accept the teachings of Jewish monotheism is excluded from the messianic "world to come." In Christianity, religious exclusivism is seen in the former teachings of the Catholic Church and the current teachings of several denominations that only those who adhere to the true faith will reach Heaven, while those outside of the true church will go to Hell. Exclusivism is seen in Islam in the acceptance of sincere Jews and Christians as people "of the Book" along with Muslims, but the rejection of other religious traditions—as well as impious Jews and Christians—as "infidels" who have no part in Allah or paradise. Historically, religious exclusivism sometimes leads to the justification of religious wars, forced conversions of those outside the faith, bans against inter-religious fellowship and marriage, and the persecution of religious minorities. However, it is also possible to practice an exclusivist faith while generally respecting the rights of unbelievers, and this is often the case today. Many religions practice a modified form of exclusivism, in which other faiths are recognized as legitimate to a degree, but not as holy as the true faith. 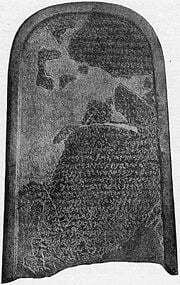 The Moabite Stone, also called the Mesha Stele, shows that the king of Moab believed his country had been conquered by Israel because the Moabites had not acted in accordance with the will of their god, Chemosh. Historically, religious exclusivism is related to the tendency of clans and tribal societies to view outsiders and inferiors, as enemies, and even as less than truly human. Tribes who make war on other tribes need to justify killing their enemies. Competition over land and resources may be the root cause of such conflicts, but tribal priests and shamans would certainly be likely to support such battles by invoking the god of one tribe against the other. In such a situation, the god of one tribal or national group will be proven superior in battle. Often a military defeat would be seen by the victorious side as evidence of the superiority of their god, while the defeated side would see the result as evidence of the deity's displeasure with his people. In the Bible, an example of this is seen in the cursing of the Philistine champion Goliath by David, who invoked the name of his deity, Yahweh against his physically superior foe (1 Samuel 17). The Israelites celebrated David's victory over Goliath as a triumph of Yahweh; but a few years earlier, when the Israelites' Ark of the Covenant had been captured by the Philistines and placed in the temple of their god Dagon (1 Samuel 4), this was seen as a result of the Israelites own sin (1 Samuel 2:12-17). Similarly, in the inscription known as the Moabite Stone, King Mesha of Moab admits that the Moabite god Chemosh had grown angry with his people and allowed the king of Israel, Omri, to conquer Moab until Mesha restored Moabite sovereignty by making sacrifices pleasing the Chemosh. The prophet Jeremiah: "Your children have forsaken me and sworn by gods that are not gods." This sense of superiority and exclusivity of one's national deity may well have been the attitude of most of the Canaanite peoples toward their gods. However, in Israel's case, Yahweh was unique, in that He could not be represented by any image, icon, or idol. The prophetic campaign against idolatry also translated into the idea that the deities of other peoples were not true gods at all; thus Yahweh alone is God. By the time of the prophet Jeremiah in the late seventh century B.C.E., we find: "Your children have forsaken me and sworn by gods that are not gods" (Jeremiah 5) and, "Do men make their own gods? Yes, but they are not gods!" (Jeremiah 16:20). The fusion of monotheism with the concept of the Chosen People brought the development of religious exclusivism to its logical conclusion. Not only was one people's god superior to another's; not only was this deity superior to all other gods; but He was in reality the one and only God which truly exists. Although he is the creator of all people, those who do not recognize and obey Him in a certain way are excluded from His blessings. This exclusivist tendency was softened in later Jewish tradition by teachings such as those found in the Book of Isaiah, in which Israel will become a "light to the nations," so that not only Jews but Gentiles too would participate in the future messianic kingdom. This universalizing trend, however, implied a doctrine related to exclusivism, namely triumphalism. In this teaching, those normally excluded are granted a degree of inclusion through their acceptance of the true faith, or acceptance of minimal conditions associated with the faith. 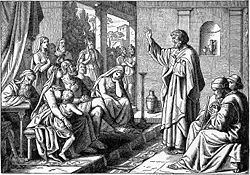 Peter preaches to the Gentiles: There is no other name under heaven that has been given among men, by which we must be saved." Whether or not Jesus himself ever intended it, the Christian church has taught from the time of its earliest writings that Jesus is the only way to God. Saint Paul, the first Christian writer, taught that "all have sinned and fall short of the glory of God" (Romans 6:23) and "there is none righteous, not even one" (Romans 3:10). For Paul, salvation lay in faith in Jesus' death and resurrection alone; and not even diligent obedience to the Law of Moses or other good works of charity and morality could bring about salvation. In 2 Thessalonians 1:8-9 Paul taught that when Christ returns, he will mete out "retribution to those who do not know God and to those who do not obey the gospel of our Lord Jesus. And these will pay the penalty of eternal destruction, away from the presence of the Lord and from the glory of His power." Acts 4:12 quotes Saint Peter, Jesus' chief disciple, as declaring: "There is salvation in no one else; for there is no other name under heaven that has been given among men, by which we must be saved." Jesus himself is quoted in the Gospel of John as saying, "I am the way and the truth and the life. No one comes to the Father except through me" (John 14:6). While other biblical quotations may be cited giving a more universalistic perspective on salvation, the fact remains that throughout most of Christian history, the Orthodox Church and the Catholic Church taught that only through faith in Jesus and partaking in the sacraments of the true church could one be saved. Church Fathers such as Origen were in the minority in teaching a universal salvation in which everyone would ultimately come to God. The majority view was that orthodox Christians alone would be saved, and any who failed to come to the true faith while they were alive on earth would be doomed to eternal damnation. John Locke taught the principle of religious tolerance. Such teachings led the Church at times to justify violence against heretics, pagans, and even Jews in the name of either bringing them to God or preventing the spread of false teachings among Christians. Even the Protestant Reformation did not stop the basic attitude of Christian exclusivism, as Protestants declared that Catholics were bound for Hell and vice versa. Even toward fellow Protestants, an exclusivistic attitude was often adopted, and specific Protestant doctrines were deemed essential by some and heretical by others. 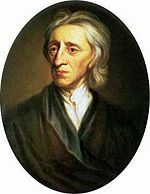 After more than a century of religious war, by the late seventeenth century, an attitude of political toleration began to emerge, notably through the writings of John Locke, who taught that civil authorities should not interfere in matters of religious conscience. This political attitude also spread to some—though by no means all—religious institutions. By the nineteenth centuries, several denominations relaxed their attitudes of exclusivism and some began expressing a more universalistic theology of salvation. In the twentieth century, the Ecumenical Movement promoted cooperation and mutual understanding within Christianity, based on the ideal of mutual acceptance and inter-communion. Several major denominations lowered barriers and welcomed members of other Christian faiths to share the sacraments with them. Some even extended this universalism to include adherents of non-Christian religions into the ranks of those who could be accepted by God. Islam began its history with an exclusivist attitude toward pagan religions, but an inclusivist attitude toward Christians and Jews. 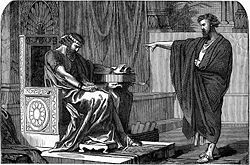 As people "of the Book," believers in the God of Abraham were given the status of dimmi, conferring on them certain rights, including the right to practice their religions openly and not to be pressured to accept Islam. Those outside of the Judeo-Christian sphere, however, were considered to be infidels. They could be forced to convert on pain of death. In practice, however, neither the inclusion of Jews and Christians nor militant exclusivism toward "pagans" was always practiced. Christians were accused of idolatry because of their veneration of icons and were also sometimes treated as polytheists because of the doctrines of the Trinity and the Incarnation. As strict monotheists, Jews generally fared better than Christians under Islamic rule, but also sometimes experienced persecution. On the other hand, Islamic rulers often considered it prudent to tolerate non-Judeo-Christian religions such a Hinduism and Buddhism, especially in areas where these faiths constituted a substantial minority population under Islamic sovereignty. The basic attitude of Islam toward other religions remains unchanged today, but it should be noted that certain Islamic nations, such as Saudi Arabia and Iran, are more exclusivistic toward other religions than are others, such as Indonesia and Egypt. In addition, Islamic fundamentalist groups strongly oppose the relaxation of Islamic exclusivism, seeking instead a return to the strict standards they believe are taught in Islamic tradition. Exclusivism is not limited to the Abrahamic faiths. Although both Hinduism and Buddhism are less prone to it, examples can be found in these traditions as well. The Hindutva and Arya Samaj Hindu sects are two examples of exclusivist Hinduism. The Hindutva movement emphasizes Hindu nationalism and opposition to Muslim influence in India, while the Arya Samaj assert the infallible authority of the Vedas, implying the inferiority of other religious traditions. Many Hindus consider that those who commit sins such as killing animals or eating meat are excluded from reaching nirvana. Buddhist religious exclusivism may be seen in the implication that those who do not accept the teachings of the Buddha, such as the Eightfold Path, are destined to repeat the cycle of suffering through endless reincarnations; while those who practice the true way can reach enlightenment. Neo-Buddhist groups sometimes consider their tradition the true path to enlightenment and engage in strong evangelical efforts to influence those they consider to be in darkness. Several sects associated with Nicheren Buddhism may be included in this category. As the world grows smaller through developments in mass communications, faster means of travel, computer technology, international organizations, cultural exchange programs, and other innovations, religious exclusivism becomes an increasingly important issue. On the one hand, religions increasingly understand and accept one another, but on the other hand exclusivism and triumphalism remain at the core of many religious theologies. Authentic dialog and cooperation between religious groups is essential in this age of international tension, especially in the context of religiously-inspired terrorism and weapons of mass destruction. However, such dialog and cooperation can only be achieved with an awareness of and sensitivity to both the exclusivist and universalist tendencies in religious communities. This article began as an original work prepared for New World Encyclopedia by Dan Fefferman and is provided to the public according to the terms of the New World Encyclopedia:Creative Commons CC-by-sa 3.0 License (CC-by-sa), which may be used and disseminated with proper attribution. Any changes made to the original text since then create a derivative work which is also CC-by-sa licensed. To cite this article click here for a list of acceptable citing formats. This page was last modified on 2 May 2011, at 14:47.